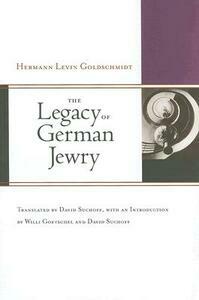 First published in 1957, The Legacy of German Jewry is a comprehensive rethinking of the German-Jewish experience. Goldschmidt challenges the elegiac view of Gershom Scholem, showing us the German-Jewish legacy in literature, philosophy, and critical thought in a new light. Part One re-examines the breakthrough to modernity, tracing the moves of thinkers like Moses Mendelssohn, building on the legacies of religious figures like the Baal Shem Tov and radical philosophers such as Spinoza. This vision of modernity, Goldschmidt shows, rested upon a belief that "remnants" of the radical past could provide ideas and energy for reconceiving the modern world. Goldschmidt's philosophy of the remnant animates Part Two as well, where his account of the political history of the Jews in modernity and the riches of Jewish culture as recast in German-Jewish thought provide insights into Leo Baeck, Hermann Cohen, and Franz Rosenzweig, among others. Part Three analyzes the post-Auschwitz complex, and uses the Book of Job to break through that trauma. Ahead of his time and biblical in his perspective, Goldschmidt describes the innovative ways that German-Jewish writers and thinkers anticipated what we now call multiculturalism and its concern with the Other. Rather than destined to destruction, the German-Jewish experience is reconceived here as a past whose unfulfilled project remains urgent and contemporary-a dream yet to be realized in practice, and hence a task that still awaits its completion.